MARION — In an age of texts, tweets and emails, Jeremy G. Vinluan stands out. Every day since turning 29 last year, the member of St. Joseph Parish in Marion does something most people do not. He sits down with a black gel ink pen, composes a personalized letter about two ­pages long in his own handwritten cursive and mails it to someone using a stamp. So far he’s sent over 200 letters and is aiming for 366 by the time he celebrates his 30th birthday on June 21, 2019. The recipients are sometimes family members, friends and people he knows — others are famous or influential figures. 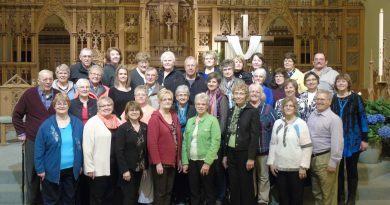 The idea for the project came after the unexpected death of a friend and fellow parishioner in 2016. 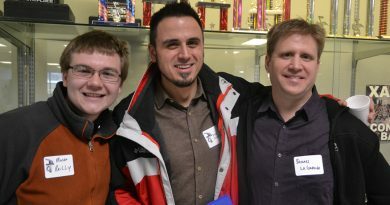 It is meant as a spiritual exercise and evangelization effort as the young man prepares to begin a new decade. Vinluan keeps track of his project with a spreadsheet because his goal is to reach someone new each day. Sometimes he knows who will get a letter based on the day. For example, Pope Francis will be sent the 266th letter on March 13 because he is the 266th head of the Catholic Church. President Donald Trump was sent his on day 45 because he is the 45th U.S. president. Vinluan’s parents were mailed theirs on their birthdays. On other days, Vinluan uses inspiration that comes to him during various forms of prayer, such as Mass, Scripture reading or eucharistic adoration, to decide who to write. “It touched me to read something so honest and genuine,” said Nicole Trapani, a parishioner at St. Joseph’s who received a letter. Andre Moorman, a member of St. Patrick Parish in Cedar Rapids, knows Vinluan through the local Theology on Tap group and was surprised by his letter. The fact that Vinluan’s letters resemble those found in the Bible is no accident. Joseph the Dreamer, King David, John the Baptist, the Prophet Ezekiel and Jesus all began important work for God at age 30, explained Vinluan. Vinluan was born in California after his parents immigrated to the United States from the Philippines. Raised in Virginia Beach, Virginia, he suffered a shock at 3 years old when he began to lose his hearing. By age 7, he was almost completely deaf, but the senses that did remain made him a candidate for cochlear implants. In school, Vinluan learned American Sign Language and became very familiar with deaf culture, something that would have an impact on his career path. 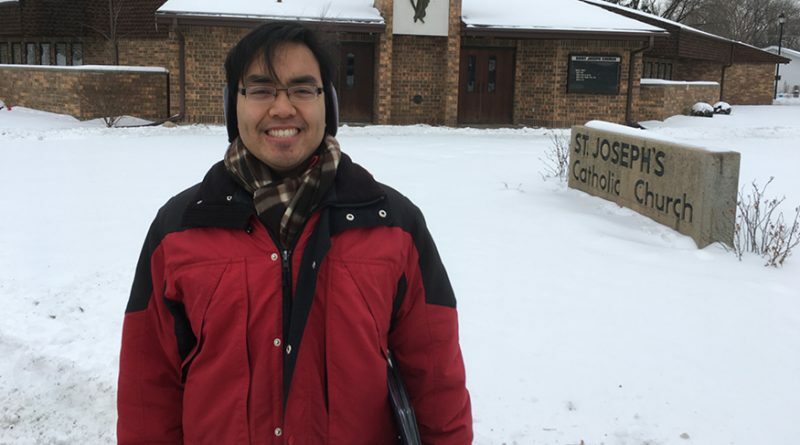 While a journalism student at the University of Dayton in Ohio, Vinluan committed with other students to spending a year as a lay Marianist, associates of a religious order with a special devotion to Mary. Vinluan’s grandmother also had a devotion to the Blessed Mother, so she inspired him to explore his faith through this avenue. During this period, from April 2011 to April 2012, he engaged in his first letter writing project, committing to reach out to people each day. After graduation, Vinluan worked in Michigan and New York. His job before coming to Iowa was as an administrative assistant to the director of New York School for the Deaf in White Plains. In 2015, he was laid off. He got a feeling that he should come to Iowa, so he applied for jobs. In 2016, he started working for Deaf Iowans Against Abuse in Cedar Rapids. 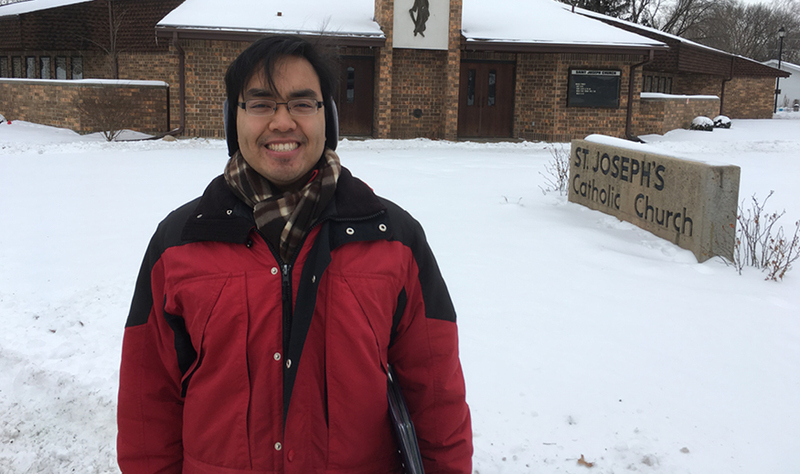 After attending Mass at St. Joseph’s soon after moving to Iowa in 2016, Vinluan was approached by Steve and Ofelia Kepros. “The moment Steve recognized me when I entered the Mass is because his wife is from the Philippines, and he could tell I’m Filipino,” recalled Vinluan. The couple asked the young man out to breakfast, and they got to know him, continuing the practice on a weekly basis and also inviting him to family functions. Vinluan was deeply affected by their hospitality, so it was a harsh blow when he heard that Stephen Kepros had died at age 76, about five months after they met. “I think the death of my friend really made me change my perspective on life,” said Vinluan. Thanks, in part, to the Kepros’ influence, Vinluan began attending eucharistic adoration for the first time in his life. He attended Kepros’ funeral and, over the next several years, threw himself with vigor into the life of the church. He is part of a young adults’ group, attends adoration regularly, serves as a greeter at his parish, and teaches classes to confirmation students from Immaculate Conception and St. Wenceslaus Parishes. The letter writing project is another chapter in his ongoing spiritual journey. Some of his letters are “time capsules” meant to be read by young children of friends or family when they are older. His final letter will be to Jesus. Vinluan’s final letter will be to Jesus. “I know my family in Virginia Beach would like me to be back home so they can celebrate with me,” he said. “I would imagine I would write my last letter at sunrise at the beach. I’ll most likely go to Mass on my birthday. “I’m most likely going to ask my family’s priest to bless the letter. I could also ask him if I could burn the letter in front of his church,” said Vinluan, who sees this final act as a symbolic gesture meant to send the letter up to heaven.